We had this trailer custom built to haul bucking bulls and travel to Futurity / Classic events. The livestock area-animals can lay down, access doors offer the ability to feed and water while on the road without unloading- getting the livestock to the events well rested. 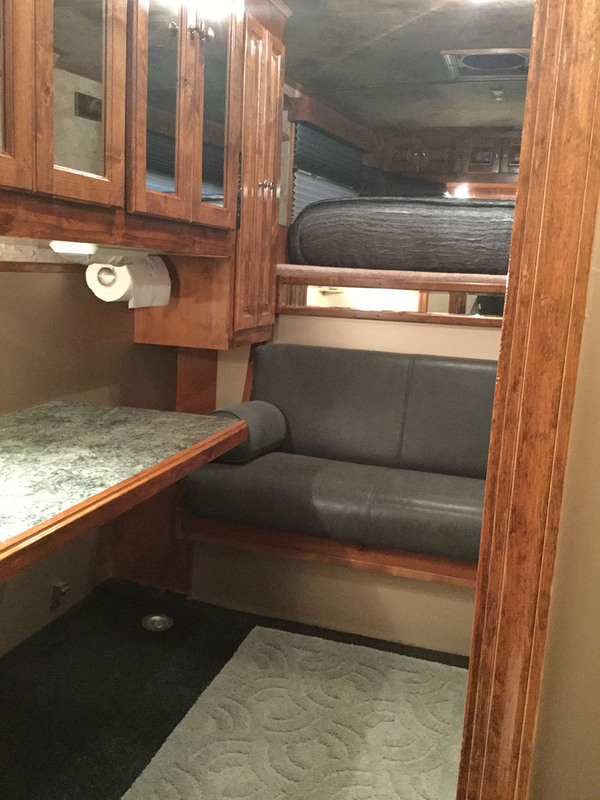 The living area offers a comfortable place to sleep, shower and rest with great amenities and plenty storage for personal items, clothing and supplies. The living area was designed with a washout floor and drains for easy cleanup and with tie- downs to haul an ATV- to make feeding easy at the events. This trailer has been stored inside a barn since new. 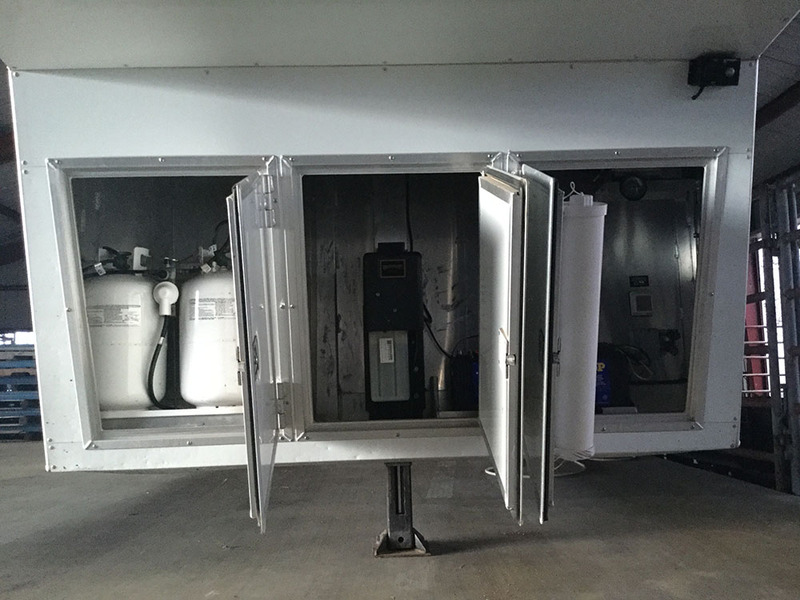 32’ long x 8’ wide- High quality, well built in excellent condition, Like New! 11+’ Living Quarters area and 20+’ Livestock Area. 3 compartments with 2 divider doors - Each compartment has feed doors. Back door is full width. Front compartment has 24” door. Walls and wheel wells rubber lined, floor rhino lined. Insulated ceiling, 6 two-way ceiling vents, Interior lights. Removable ply glass. The best of both worlds! Practical Interior floor - rhino lined with drains for easy washout. Good looking cabinets: Dark hickory with mirror doors. Lift lid box cabinets along bed. Hickory cabinets throughout living area and bathroom. Marble Naugahyde wall and ceiling covering. Golden- tan color wall covering in bathroom and lower part of living area, for easy washout cleanup. 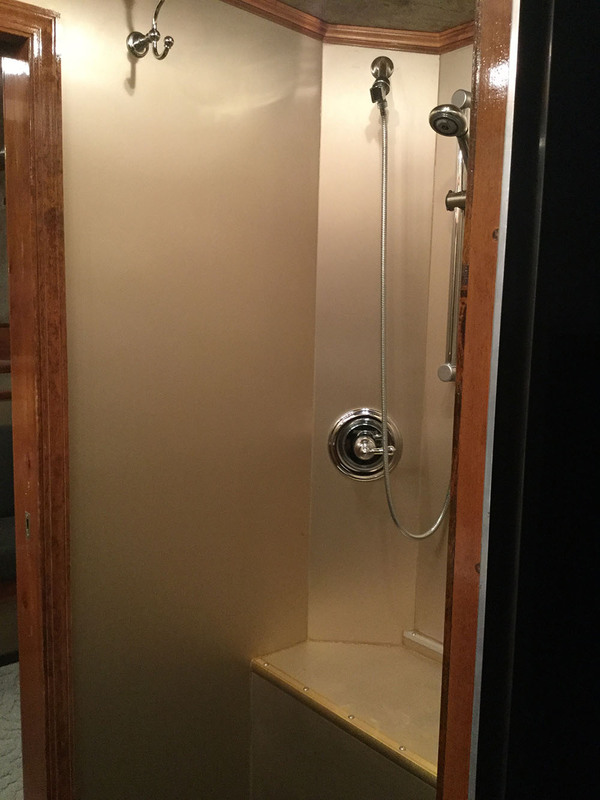 The Bathroom has a “Cowboy Style” shower with shower bench (No shower enclosure) – Bathroom walls are golden-tan in color, smooth aluminum for easy cleanup in this cowboy style shower room. Toilet- Hi Profile. 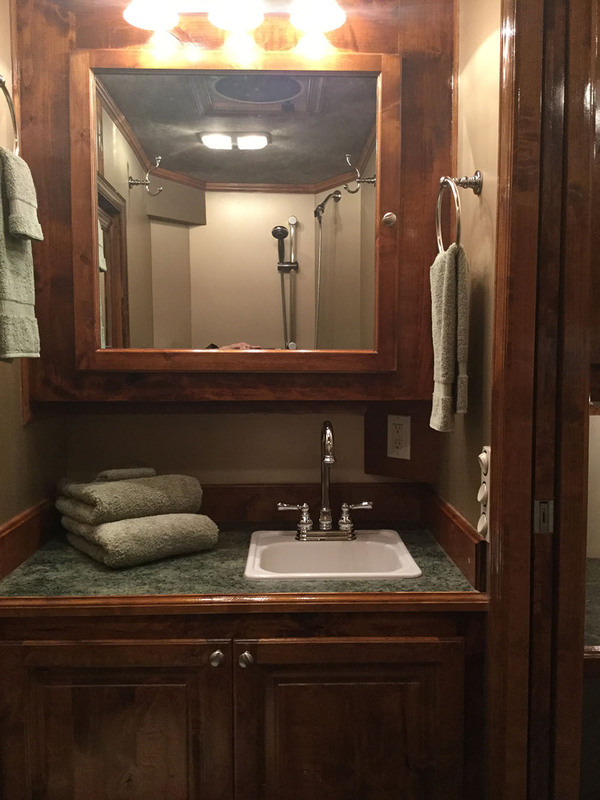 Up graded shower fixtures, bathroom sink fixtures and towel bars. Queen Mattress, Pillows, Moss Green bed spread, pillow shame to complement countertop color. Leather Sofa/ Fold out bed. Fold down table. Phantom Brand- retractable screen door. Windows- Day/Night cloth shades and hickory wood valances. 20” Flat Screen TV. Direct TV Receiver. Automatic signal finder satellite. VCR/DVD combo. AM/FM CD Player. JVCI Speakers. TV Antenna. Microwave. 13,500 BTU Air Conditioner with heat strip. Fuse panel, Control panel to operate- generator, water heater. 10 Gallon Hot Water heater- LP and Electric- interior push button start. 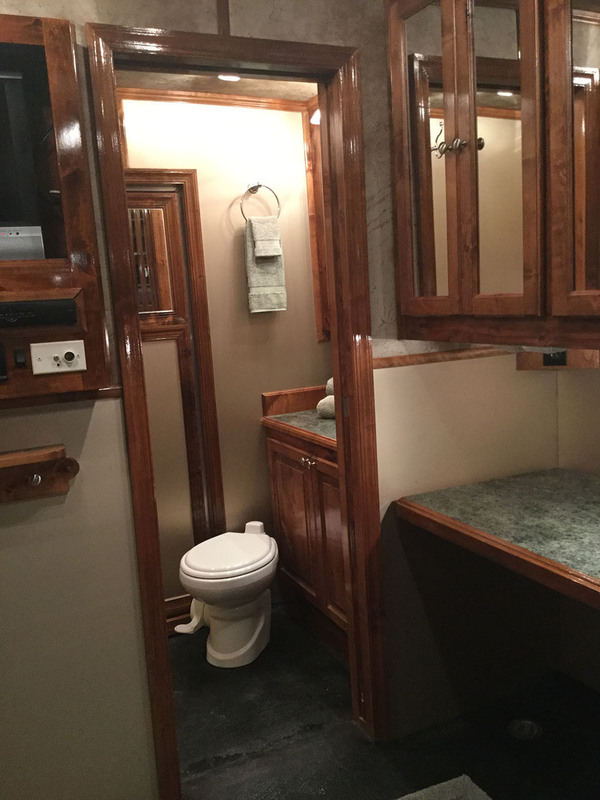 2 Power Roof vents with Speed Controls- 1 bathroom, 1 over bed. Oversized 4’ door in living area to haul a ATV / 4-wheeler. Tie downs in floor area to secure ATV. Generator- Onan Marquis Platinum 5500- Location roof. Oversized generator platform. External speakers. Radio antenna. Exterior TV hanger and hookups. Tailgater grill with receiver hitch and LP hook-up. Exterior lighting- each side, back and nose storage.